On Thursday 16 August 2018, Steve Kyritsis, writer and president of the Hellenic RSL and the Australian Hellenic Memorial Foundation in Melbourne, will present a lecture about the Greek-Australians in the Australian Forces during the World War II, at the Greek Centre, as part of the Greek History and Culture Seminars, offered by the Greek Community of Melbourne. According to Steve Kyritsis, Japanese during WWII had an objective to capture Port Moresby and use Papua New Guinea as a springboard to launch attacks into Australia. 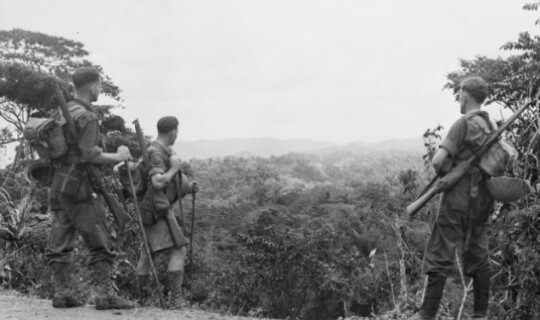 The only way to do this was to land ground forces at the northern part of Papua New Guinea and proceed towards Port Moresby through a narrow track known as the Kokoda Track. Thousands of Australian servicemen were involved in defending this track and halting the Japanese advance. The Kokoda campaign consisted of a series of battles fought between July and November 1942 where the fighting was some of the most desperate and vicious encountered by Australian troops in the Second World War. Steve Kyritsis was born in January 1947 on the Dodecanese Island of Nisyros and migrated to Australia in 1959 with his parents and two three sisters. His family settled in North Carlton where he attended Princes Hill High School and the local Greek School in Drummond Street. He studied at RMIT and became a licensed theatre projectionist. In July 1966 Steve was conscripted for two years into the Australian Armed forces and saw active service in Vietnam with the Third Battalion, Royal Australian Regiment, an infantry unit. Since 2000, Steve has been involved with the Returned Services League of the Hellenic RSL, the Australian Hellenic Memorial and the Melbourne Shrine of Remembrance. He has also an author of three books on Greek-Australian Servicemen in the Australian Armed Forces: Greek-Australians in the Vietnam War 1962-72 (2009), Greek-Australians in the Australian Forces WWI and WWII (2012) and recently Greek Australians in the Australian Kokoda WWII (2017). In 2015 he was awarded the Order of Australia (OAM) for his services to veterans, veteran families and the Greek Community. He was further awarded the Victorian ANZAC of the Year by the National RSL of Australia, the first person of Greek origin to receive such an award. Presently he is the serving President of the Hellenic RSL and the Australian Hellenic Memorial Foundation in Melbourne.